One of the more unexpected releases at Superbooth this year was a hardware synthesizer from IK Multimedia. It looks all right, it sounds pretty tasty and has a decent feature set for a great price. They might have got the UNO spot on, which is unusual for any first foray into something new. We’ll all be able to check it out as the UNO is starting to ship. 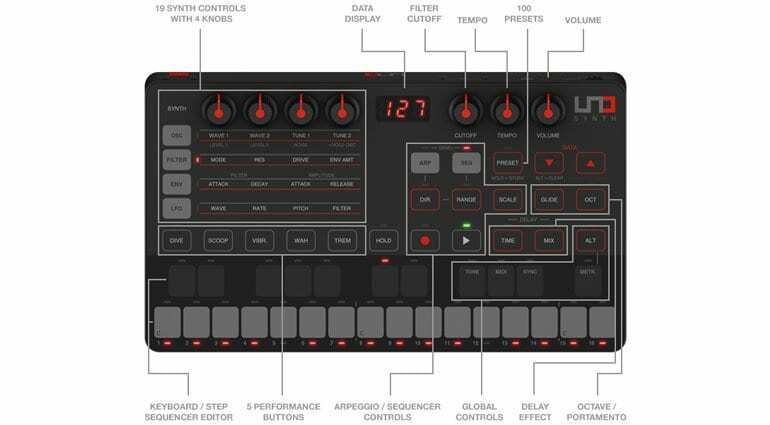 The UNO Synth is a pleasant surprise. 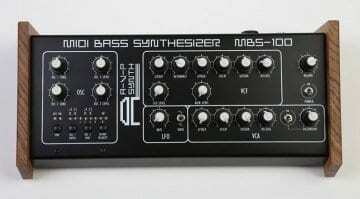 It seems to have a rich analogue sound, with lots of variation and appears to be easy to program. They’ve taken a matrix approach with 4 encoders that become controllers over whatever row you’ve selected on the matrix. 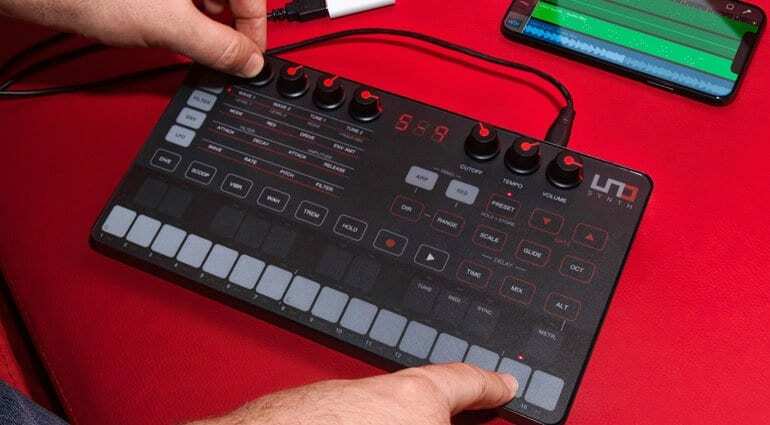 Of course, we love to have single knobs per parameter but this is a neat and cost-effective way to give versatile hands-on control in a small space. Although it looks like a membrane button interface it’s actually a touch-capacitive surface and responds to the lightest of finger prods. 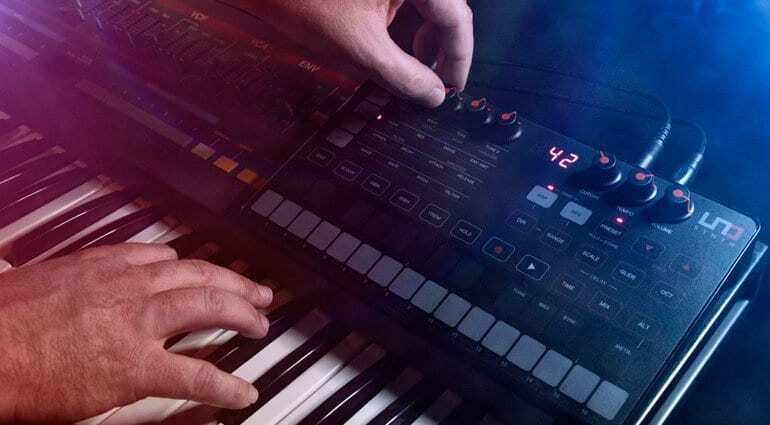 The two-and-a-bit octave keyboard is rubbish to play but really quite neat for note entry and banging out ideas – this is a monosynth after all, not a piano controller. 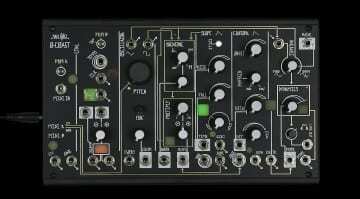 The two oscillators, noise generator, filter and amplifier all run on an all-analogue signal path. The regular three waveforms (saw, triangle, pulse) can be morphed between giving you all sorts of unexpected variations and colours. The 2-pole OTA-based multi-mode filter has a nice resonant sweep and a chunky overdrive. The LFO has 7 waveforms and can be assigned to pitch, filter, amplifier and pulse width modulation. 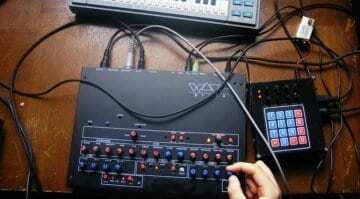 The 2 oscillators can be tuned differently giving you some pad-like interval sounds and octaves. There’s an inbuilt delay but there’s also a bunch of “performance modulations” called Dive, Scoop, Vibrato, Wah and Tremolo. All in all there are over 40 controls that can be accessed through the front panel. An editor/librarian is on the way to give even more control directly in your DAW. 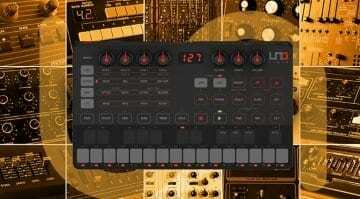 And to round it off there are 10 arpeggiator modes and a 100 pattern sequencer. 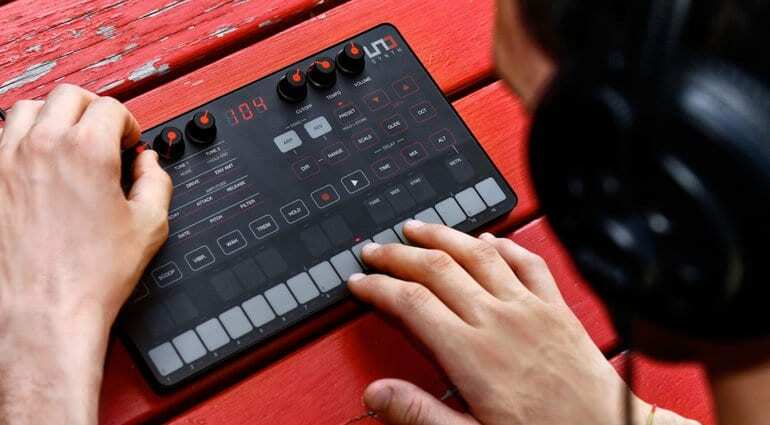 It’s not the most beautiful or classically designed monosynth on the market but for only €199 you get a neat, portable and capable little synth with patch saving, sequencing and tweaking galore. Find it at your local dealer or order direct from IK Multimedia with free shipping.